If you are a mortgage broker looking to get more leads from your website or online presence email us today at jesse@wojdylosocialmedia.com. We have a number of monthly Mortgage Broker SEO packages that can help you rank higher in search. As many people have noticed the local Google pack has gone through some drastic remodeling recently. The most recent update of the local pack only displays the top three local business’ for any given keyword. This update affects many businesses in all fields. Before the update there were seven businesses displayed in the local pack that included a phone number and a listed physical address. The top three from the original seven business pack are, in most cases, the same businesses that are now featured in the local pack. If you are ranked top three for your town the new pack is great. There is less competition with only three businesses listed. If you were listed number 4 – 7 chances are you are no longer listed in local packs. This is not so great as you are now losing out on potential business. The old local packs ranked businesses by geographical proximity to the searcher. The new local packs are a different story. Many have noticed that with the new local packs, businesses are being ranked by quality of the overall business and online authority. Pretty much, anything that shows the Google algorithms that the business is quality will improve its ranking in the local pack. Positive reviews and testimonials, natural links to a business’ website, and unique content will give a business’ website more authority. Google is ranking mortgage brokers and businesses based on the quality of the business rather than proximity to the search. This steps up the competition for ranking in those three local pack spots. Another thing I’ve noticed is businesses in towns neighboring the town being searched, with a higher quality web presence, are ranking in local packs over businesses that are actually in the town that is being searched. Again, this is because the quality of these businesses is much better than others in the town being searched or near the location of the search. Now that competition for local packs is higher than ever, mortgage brokers and professionals will need to step up their optimizing if they want to be listed in the new local pack. Businesses that are already top three in the local pack are not safe, they will need to continue their optimization efforts if they plan on staying in the top three. 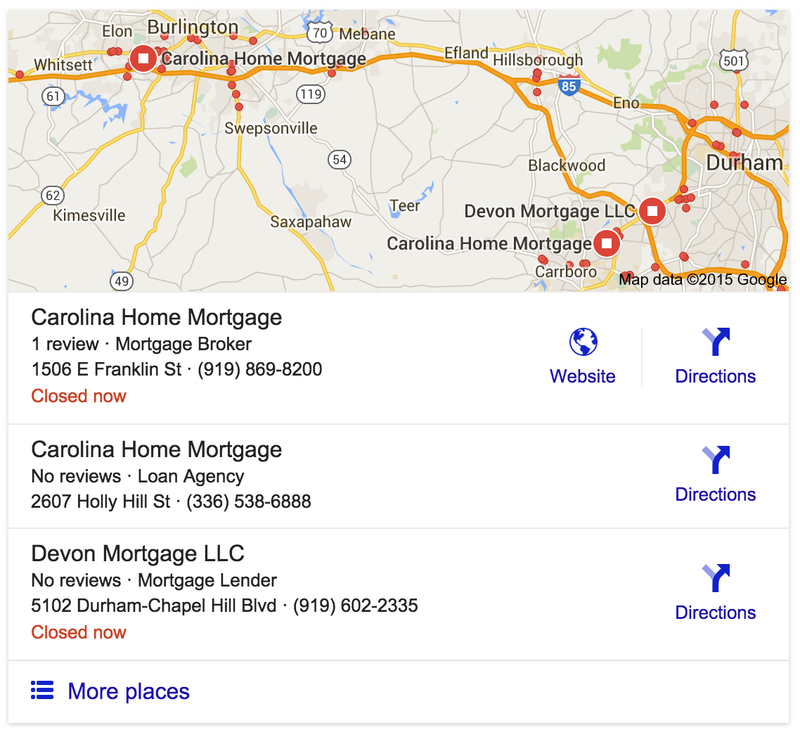 When optimizing for Google’s local pack there are three major components to keep in mind. Keep these in mind when optimizing: fresh content, links, and reviews/citations. Use these components to jump into one of those three local pack spots and gain new customers/clients. Just like ranking in traditional Google search, fresh content is a must have to rank top three in local pack results. Google ranks businesses based on how well they believe the business is able to satisfy the needs of the customers. If a business has a webpage that is very bland and does not give the potential customer the information they are looking for, that business will not rank. On the other hand, if you have fresh, relevant content that gives plenty of information regarding the physical location of your business as well as phone numbers, you will find your business climbing the rankings. When adding your physical location it is best to do this in the footer of your website. Just add a textbox in the footer of the site and add the address. You may also want to consider a contact us page. Keep in mind you want to be consistent with the formatting of the address. Always have it listed the exact same way every time. You will also want to sign up with Google My Business and make 100% certain the information Google has is correct. It is very important not to publish redundant information that is used by every other business you are competing with. You need content that is unique to the mortgage industry or your business. Some ideas that have helped clients in the past are writing about all the types of mortgages and pros and cons for each type of home loan if you are a mortgage broker. When publishing the content you should have the desired local keyword you would like to rank for in the title of the page as well as in subtitles. The great thing about adding organic content to your website is that you will improve your rank in Google search ranking even if you fail to crack the top three in local packs. Links are just as important to ranking in Google local packs as they are to ranking in Google organic search. When building links you should be sure that the links are natural. This means that other websites willingly link to your website from their own website. When this happens it shows google that others trust your content. You should avoid paying for links in any form. At first, unnatural links will seem to help your business’ rank. In reality, if they are detected by Google, they will punish your business’ website in the end. The best way to get natural links is to create a quality resource that other websites will find beneficial for their visitors. Google algorithm updates such as Google Penguin go after websites that have over optimized with links. The Pigeon or Local Search algorithm looks for businesses that are not only close to the searcher but that will also satisfy the customers’ needs. Customer reviews are a great way to show Google that your services were appreciated by the customers. The only way to ensure that your business receives strong reviews online is to make sure all of your customers/ clients receive the best services possible. You can also encourage clients to rate and review your operation after you have done business with them. Citations are business listings on third party websites such as Yelp, Zillow, Trulia, Homes.com or Yellow Book. You should list your business in as many of these websites as possible. Google’s Pigeon algorithm will use these citations to determine the authority of your business’ website. When listing your business on Yellow Pages or other ratings sites, you should list contact information and the physical address of your business the exact same as you did in the footer of your website. Keeping this information consistent will contribute greatly to ranking in Google local packs. If you follow these steps correctly and gain enough authority, you could even rank for the local packs of neighboring towns/cities. This is the goldmine of local pack SEO. In order to do this, you have to beat out all of the other businesses that are competing for the same town. Your business’ online authority will need to outweigh competitors authority in the towns in which you would like to rank. You will need to create content for your website that contains the names of the neighboring towns you would like to rank for. Also, you will need to keep the content for every nearby town up to date and fresh in order to continually rank top three in those towns. Your website will need more natural links than businesses in the towns as well. If you can manage to rank top three in two or more towns your business will begin raking in profits. If you want your business to rank in the local pack for multiple cities/ towns in your area but do not have the time to continuously optimize your website, don’t hesitate to email us at jesse@wojdylosocialmedia.com. Our specialists will be able to help you earn a top spot in Google search as well as Google local packs and expand your business’ potential.